Entries close tomorrow (30 April) for the ever popular ISIS Challenge close, so visit www.brentfordfccst.com now for race times, entry details and online bookings. Residents of Hounslow and neighbouring boroughs are invited to get active on the first May bank holiday weekend and join the ISIS Challenge 2014, taking place on Sunday 4 May. The ISIS Challenge, which is being organised for the third year in a row by the Brentford Football Club Sports Community Trust (BFCCST), includes a 1K and 5K run in the beautiful setting of Syon Park and a paddleboard time trial on the Grand Union Canal at Brentford Lock. The day will be topped off with a free-to-enter family fun day, a Youth Football Tournament and an awards presentation in Syon Park from 12 until 4pm. The running and paddleboard events have been organised into two age categories, Adult (17+) and Junior (16 & under), which makes the ISIS Challenge a true family event. Participants of any age can take part in either run however the 1k run is aimed primarily at youngsters and families. The race route weaves through stunning grounds of Syon Park, a section of which goes through the private gardens which are ordinarily closed to the general public. Runners of all standards are encouraged to take part and see how fast they can complete their chosen distance. The races start at 12pm. 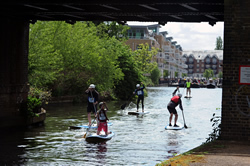 The water element of the ISIS Challenge 2014 is the opportunity to take part in a paddleboard time trial, located on the canal-side by the Holiday Inn at Brentford Lock. Stand up paddle boarding (SUP) is an increasingly popular adventure sport in the UK and can be enjoyed by individuals, groups and families. Larger boards can enable parents to take a small child on board safely whilst older children can paddle their own board and there are no upper age constraints. Basic event day tuition will be available for all participants of the ISIS Challenge 2014 and pre-event lessons can also be arranged by emailing isischallenge@brentfordfccst.com or calling 020 8326 7030. Registration for this event starts at 8am. The event is sponsored by ISIS Waterside Regeneration, the company leading an 11 acre residential and commercial development at Brentford Lock West. ISIS Waterside Regeneration is a partnership owned by the Canal & Riverside Trust and MUSE Developments and is focused on delivering sustainable waterside communities. 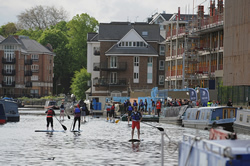 ISIS is working closely with BFCCST to ensure that the water sports opportunities at Brentford Lock are incorporated into the development plans, including the provision of a new water sports hub on the banks of the Grand Union Canal. Awards for the fastest in each of the events and categories will be presented at the free family fun day being held in Syon Park from 12 until 4pm. The awards will be made on the centre stage by representatives from BFCCST and ISIS Waterside Regeneration at 3.45pm.